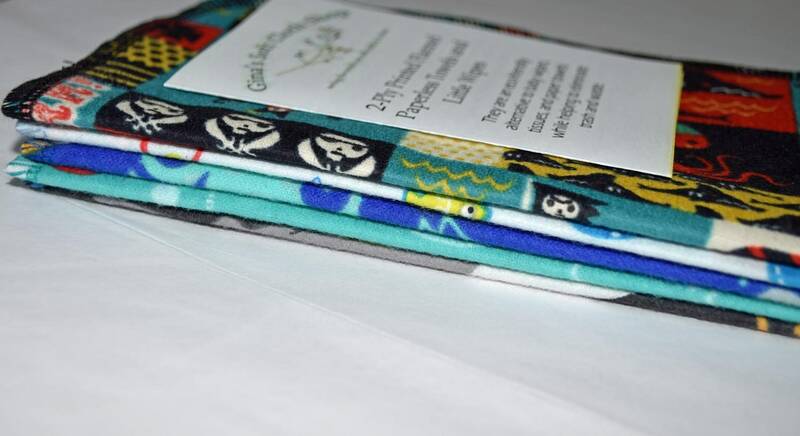 Stack of 5 eco-friendly alternative to paper towels, napkins, and throw away baby wipes. EXTRA THICK What a great set for the fun-loving and imaginative boy in your life. This is a great way to help eliminate trash, and an easy way to help the environment. 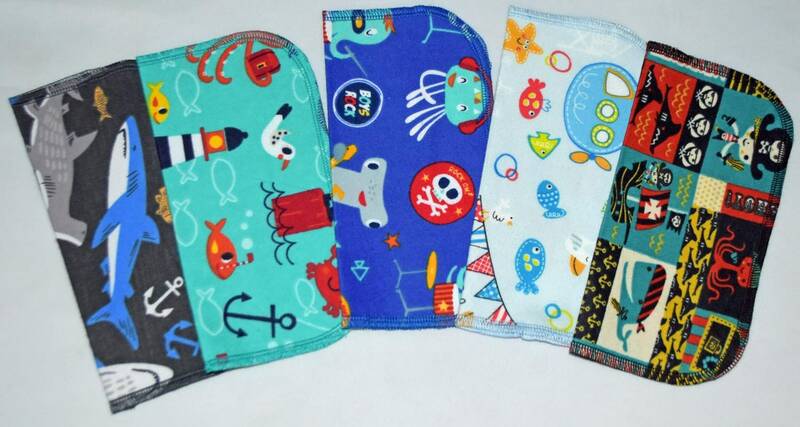 The Little Wipes are perfect for little hands, but are thirsty enough to dry big hands, too. Great for casual, every day napkins (and they won't fall apart like paper napkins do). Nice and gentle enough for little ones face or behind; and, a great thing to keep in your purse for messy emergencies when you are on the road. 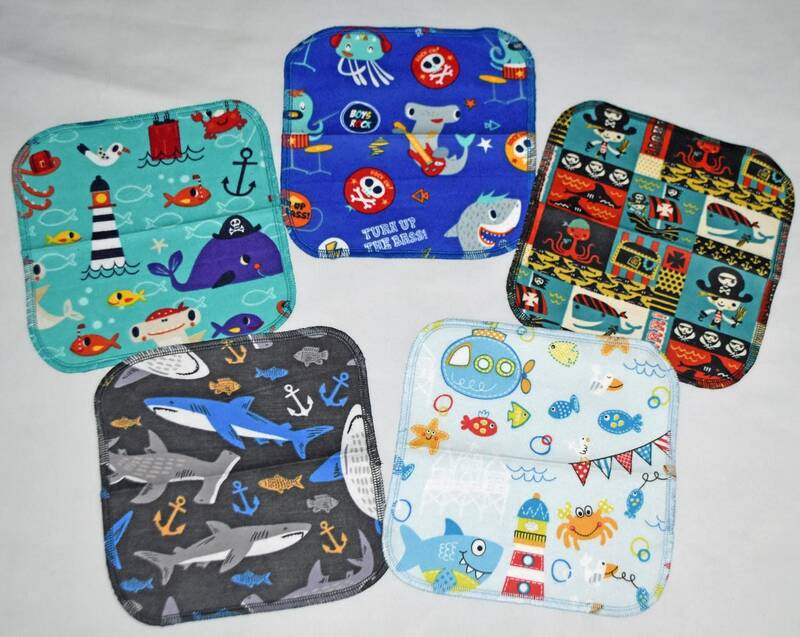 The Little Wipes are serged around the edges with long lasting, but very soft polyester thread for a clean finish. You can expect these work-horses to last for a very long time. Use them to mop up any spill, dry your hands, or for any typical use of paper towels. I throw mine in the washer and dryer with any and all loads of laundry (they take up very little space), because no special care is required. 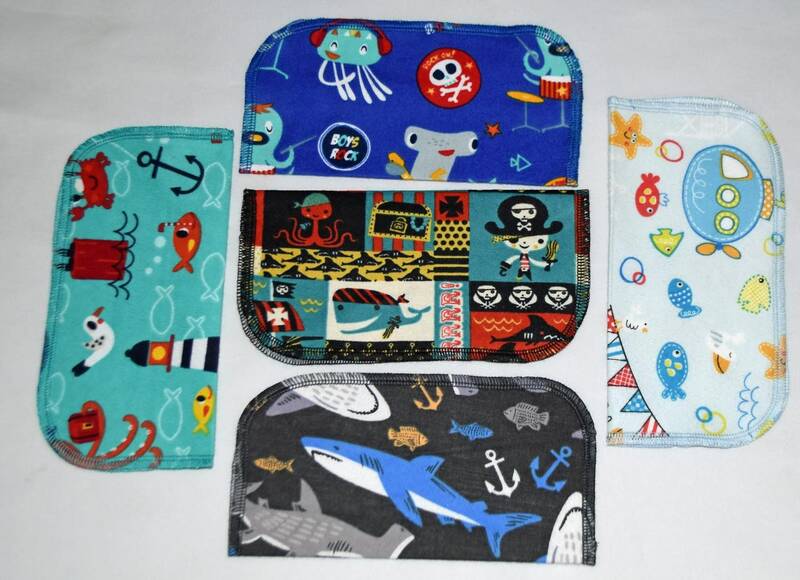 These napkins are perfect for a gift for the kid in your life. Try them and love them, or send them back for a 100% refund. Cut, sewn, and finished here in the USA by Americans. This set is in stock, and ready to go. ***Sets may vary slightly **** Parents and teachers have told me that these napkins have proven to be a great conversation starter and learning tool. You can ask your child: "Can you find the orange boat on this napkin?" or "Let's count all of the fish together". You get the idea!